Hi! This is Sara again and today I have an amazing sewing tip for you on how to make bias tape the fast way! On Tuesday I shared this tutorial on how to transform a sweater into a cardigan using bias tape as bias binding on all edges and as a closure (ties). Did you know you can make you own bias tape? 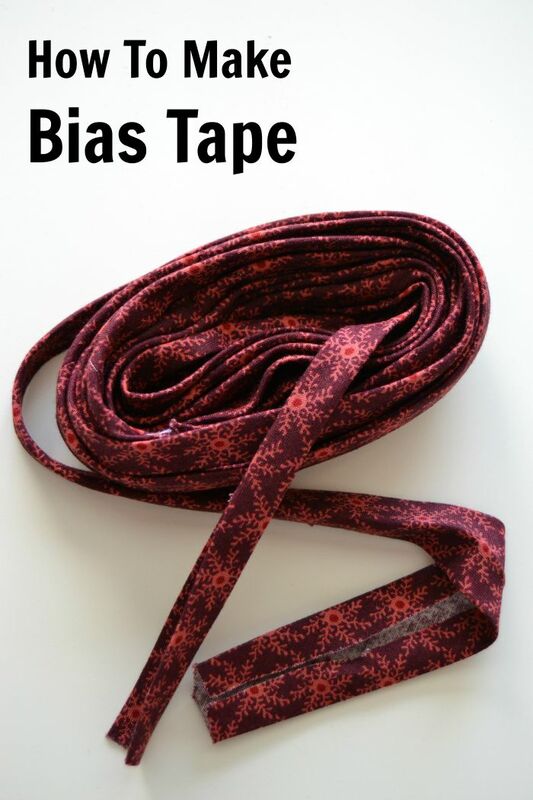 There are a few different kinds of bias tape (one fold, double fold, etc.) and a couple of ways of making them. 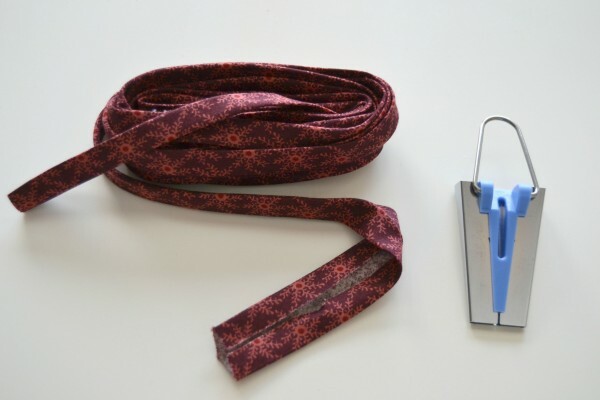 Since we need double fold bias tape for the cardigan I thought I would share with you how to make it. The method I am showing you today is on how to make a continuous strip of bias tape from one square of fabric! All you have to do is sew two seams and then cut around and around until you end up with a huge strip of bias tape! 1) Start by cutting your fabric into one perfect square. I started with a 18×20” fat quarter so I had to cut it to a 18×18” square. 2) On the wrong side of the fabric trace a diagonal with a pencil or tailor’s chalk, from one corner to the other, using your ruler. 3) Cut along that diagonal. 4) Place the two triangles right sides together as shown on the image. Pin and sew with a 1/4” seam allowance (SA). 5) Press the seam open. 6) On the wrong side trace parallel lines that are 2 inches apart, using a tailor’s chalk or a washable ink pen. 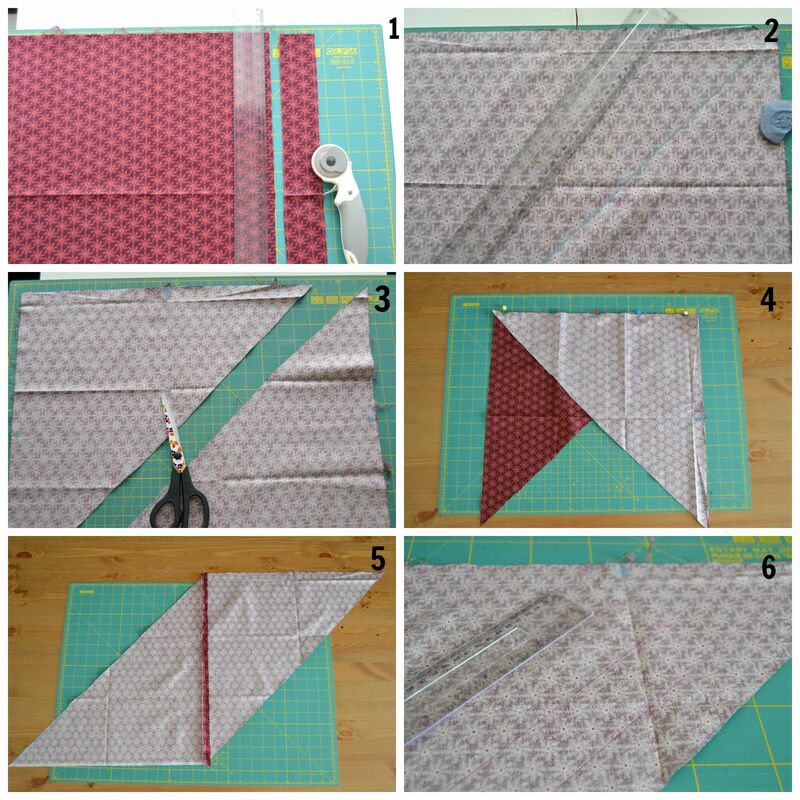 7) Turn the fabric piece with right side up and fold both upper and bottom edges to the center as to form a square, with the lines matching at the diagonal center edge. 8) Pull the upper left tip to the left until the lines move one line to the left (they will now be re-aligned with the next line). 9) Grab the two diagonal center edges and place them right sides together. Pin and sew with a 1/4” SA. 11) Start cutting along the lines all the way until you go around and around through all the lines in a continuous cut. Now you just need to fold this strip to make it a double fold bias tape. 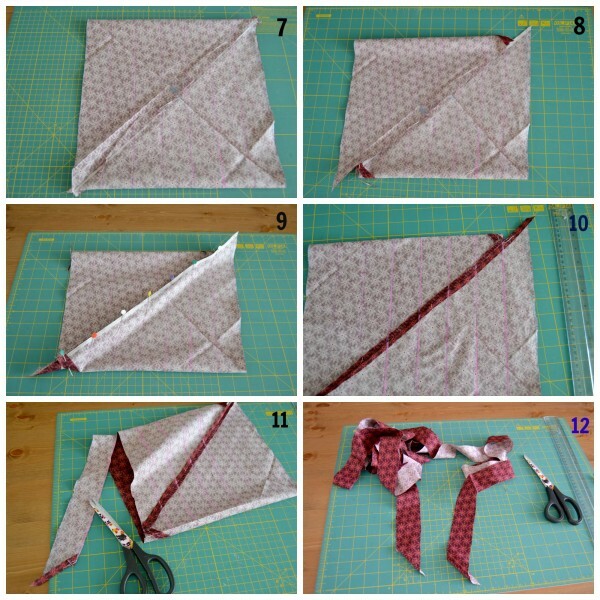 Go check this tutorial from Patchwork Posse to see how you can make it! It is not that hard, isn’t it? I love to make my own bias tape, this way I can choose exactly the color or print that best match the garment I am making. And the best thing is it really doesn’t take much fabric! I used a 18×18” fabric piece and ended up with almost 2 yards of bias tape! I hope you enjoyed my first posts here at Patchwork Posse as a contributor. I will be back soon with another apparel sewing tutorial and hints & tips. In the meanwhile you can stay in touch over Made by Sara.